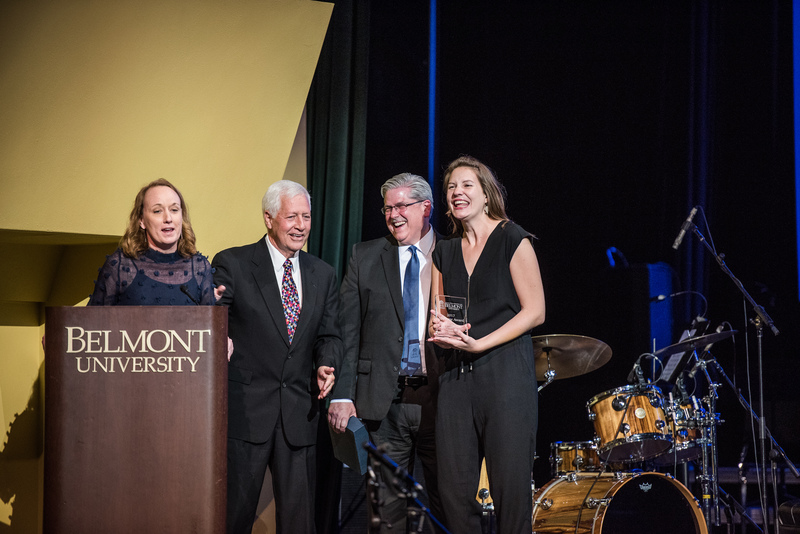 Belmont University’s College of Visual and Performing Arts recently honored the Arts & Business Council of Greater Nashville (ABC) with the Applause Award at the 28th Annual President’s Dinner and Concert. The award, given annually to honor those who have made significant contributions to the arts, is the most distinguished award presented by the College of Visual and Performing Arts. Founded in 2006, ABC leverages and unites the unique resources of the arts and business communities to create a thriving, sustainable and creative culture in Nashville. The organization’s work helps the city be an exemplary cultural hub that fosters creativity supported by talent, tolerance and technology. ABC offers four main programs including Volunteer Lawyers and Professionals for the Arts, Education, Arts Board Matching and Work Creative. The Volunteer Lawyers and Professionals for the Arts program provides pro bono legal services to low-income artists and arts nonprofits including drafting and reviewing contracts, protecting their work with copyright and trademark and resolving arts-related disputes. Approximately 300 volunteer lawyers and professionals involved in the program have provided more than $2.7 million in free legal and business counsel to 3,000 artists and 500 nonprofit arts organizations. The Education program teaches individual artists, creative professionals and arts nonprofits about the business of art through monthly seminars and intensive training opportunities. ABC’s Arts Board Matching promotes dynamic leadership and increases business engagement in the Nashville arts community by training talented professionals on the essentials of board services and connecting them with arts nonprofits. Lastly, the Work Creative program offers in-office art projects to bring visual and performing arts into the workplace to stimulate communication, build teamwork and spark innovation for effective business growth. Previous Applause Award honorees include Michael W. Smith, the Grand Ole Opry, Eddy Arnold, Chet Atkins, The Beaman Family Foundation, Vince Gill and Amy Grant, Donna Hilley, Ronn Huff, Martha Ingram, the Nashville Ballet, the Nashville Opera, the Nashville Symphony, Barbara Massey Rogers, Kenneth Schermerhorn, Ricky Skaggs, Jerry Warren, Sam Wilson, Dr. Cynthia Curtis and CeCe Winans.